The population of Moe, 135 km east of Melbourne on the Princes Highway, has hovered around the 15,000 mark since 1961. While most larger rural towns in Victoria have seen modest growth, none have had completely static population growth over such a long period. Primarily the product of brown coal deposits, Moe grew rapidly in the 1950s as did nearby Yallourn, which completely disappeared in the 1980s when the model township was resumed as a coal mine. The Victorian Housing Commission built 1500 homes in Moe for electricity and railway workers. The privatisation of Victoria’s electricity industry, under the Kennett Liberal Government in the 1990s, saw a rapid rise in unemployment and a halving of house prices. The city itself has good facilities and a pleasant landscape setting in the wider Gippsland context, but it unlikely to ever grow again as quickly as it did in the 1950s. Moe is situated at the western end of the Latrobe Valley, on the Princes Highway and Gippsland railway line. The area to the west was originally an extensive swamp, bounded to the north by the Great Dividing Range and to the south by the Strzelecki Ranges. The swamp provided abundant food resources for the Woiwurung people who occupied the area. The marshland was generally known as ‘The Mowie’; the name, with various spellings, said to be derived from an Aboriginal word meaning swamp. A pastoral run, Merton Rush, was taken up in the area in 1846. From 1861 the small settlement of Westbury, north-west of present Moe, was a staging post on the coach route into Gippsland which skirted to the north of the swamp. However, from 1877 when the railway into Gippsland was constructed, a settlement developed around the railway station. The town was surveyed in 1878 and there were soon hotels, stores, banks, churches a school (1879) and a mechanics’ institute (1884). The Shire of Narracan was proclaimed in 1878 and shire offices were opened in Moe in 1885. 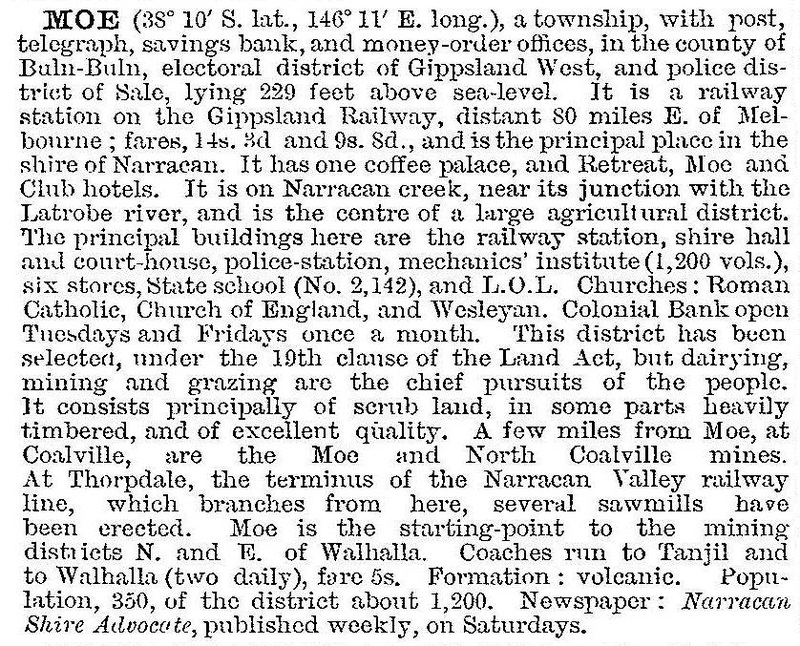 Farm selectors arrived in the Moe district in 1873. During 1894-99 swamplands were drained and farm blocks keenly sought after. A co-operative dairy (butter) factory opened in 1906 and continued until 1980. Agriculture, however, would take second place. In the late 1870s black coal was discovered in the Narracan Creek valley to the south of Moe. This lent strength to the movement for a branch rail line which was completed in 1888. There were stations at Coalville, about 7 km from Moe, at Narracan about 10 km away, and at Thorpdale, the end of the line, 17 km from Moe. Several coal mines operated around Coalville until the late 1890s. Farm produce was also transported to Moe by rail. In 1909, the shire offices were moved to Trafalgar, west of Moe. A railway line from Moe to Walhalla was opened in 1910. Purvis Stores, opened for business in Moe in 1910 eventually opening throughout the Latrobe Valley. (Their slogan was ‘Purvis for Service’. The firm became the Aussie Disposal chain.) The township of Moe serviced the surrounding agricultural district and by 1933 had 898 inhabitants. Moe grew rapidly after the end of World War II. Labour was needed for the brown coal mines and electricity generation industries at Yallourn and Morwell to the east. Much of this labour was provided through immigration from Britain and Europe. House-building land at Yallourn had all been used up. From 1947 to the mid-1950s the Housing Commission built 1500 homes in Moe, mainly south of the railway for the workers and their families. By 1955, the population was 13,500. The town’s focus was now the industrial Latrobe Valley rather than the rural countryside. Its area included Newborough. In 1963, it was declared a city. As Moe grew, it attracted secondary industries, such as textile and clothing mills, manufacture of concrete pipes, furniture and aerated waters, processing of dairy products, timber milling, engineering works, and photographic developing and processing. By 1981, the population was 16,649. From the late 1980s, a combination of economic recession plus restructuring and privatisation of Victoria’s electricity industry led to substantial unemployment in Moe. From a median house price of about $60,000 in 1992 the figure fell to $45,000 in four years. Moe’s social problems were more severe than other areas, having higher unemployment and lower incomes than other towns in the Latrobe Valley or in Victoria in general. Moe also had more single parents with dependent children and a higher gambling (poker machine) turnover than the other towns in the Latrobe Valley. The hospital, partly funded by workers, was closed in 1998. Moe is well situated in Gippsland’s landscape. It shares the flood plains of the Latrobe River and the Narracan Creek, with views to the Baw Baw Ranges (north) and the Strzelecki Ranges (south). It is shielded from the coal open-cuts by the Haunted Hills. Little of this is apparent to the car traveller who, upon reaching Old Gippstown, has the choice of the old highway through the town or the Princes Freeway. Usually the car traveller takes the freeway, which also passes through the town, with high sound-protection fences either side. Not much of a view and that was Moe! Less than five years after Moe’s privatisation and misfortunes, a child Jaidyn Leskie, disappeared in 1997. The investigation went on for years and his body was found in the Blue Rock dam. An inquest was held in 2003. Moe was maligned, with offhand remarks reported about ‘mocassin country’ and ‘low-rent losers’ (The Age, 26 July 2003). Moe deserved better, and the Committee for Moe was working for that. Moe has an attractive landscaped shopping centre and there are good educational, recreational and sporting facilities. Gippsland Heritage Centre houses a number of historic Gippsland buildings, including Bushy Park, the homestead of explorer Angus McMillan. The Moe Jazz Festival is held annually in March and the long established Moe Racing Club (1888) holds a number of meetings each year. Lake Narracan, north of Moe, provides facilities for water sports and the Edward Hunter Heritage Bush Reserve, Apex Park and the Botanic Gardens are popular recreation areas. The Moe and Narracan News is published weekly. Moe city was united with Morwell and Traralgon cities, Traralgon shire and parts of Narracan and Rosedale shires to form Latrobe city. CBD powerlines were placed underground in 2012-13. The Moe Rail Precinct Project including a Moe Civic Hub, with a cafe, library, community kitchen and meeting rooms, was commenced in late 2014. Moe's three State primary schools were Moe (118 pupils), Albert Street (183 pupils) and South Street (249 pupils) in 2014. The 2011 census for Moe-Newborough recorded depressed circumstances. Unemployed persons were 10.5% of the labour force (Australia, 5.6%) and one-parent families were 24% of all families (Australia, 15.9%). Incomes were similarly disadvantaged: residents’ median income was 68% of the Australian median.